“Have you seen Dave Gunn’s layout?” That’s what Jason Shron asked me earlier this month. On Jason’s recommendation, I contacted Dave. He was right; Dave does have a gorgeous HO scale layout, as you can see in the photos below. What is the era? Why did you choose that one? I model the 1950s, the transition period. I chose it because I like to be able to run both steam and diesel. Plus, it’s the period I grew up in. What is the locale or region? Why did you choose that one? The layout is based very loosely on the 110-mile run between Nappanee and Ottawa, running through Smiths Falls. It connects Ottawa to the Montreal-Toronto Corridor. I chose it because I grew up in Ontario. 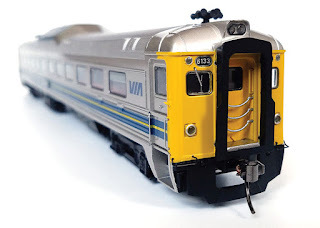 What railway (or railways) do you model? Why did you choose that one? The CNR of course! I have always loved the green, gold and black colour scheme. What is the size of the layout? The basement room is 40-feet square, which also includes the sitting area and workshop spaces. The layout covers approximately half the space. I am about halfway around the room, so far. What is the length of the mainline? It’s approximately 80 feet long. There are five different places for the tracks to disappear through the walls. I use code 83 Peco track, with all track glued in place—not a single track pin has been used. Main line tracks are laid on cork road bed, and the sidings directly on base boards. How do you operate the layout? I have full operating sessions available with wheel reports, switch lists and schedules drawn out on graph paper showing all trains in a 24 hour period of operation and detailing all passing locations and stopping times, etc. Every car has a purpose and destination. What is your control system? I use Easy DCC wireless from Texas. It works very well. I have two fixed controllers and two wireless controllers, as well as mobile phone connections for extra controllers when required. What scenery methods did you use? I use my own mixtures of scenic materials, including real dirt and soot that came from the age of steam. For the rock faces, I used real rock from our local cliff face. For the clouds, I used paper cut-outs, then sprayed on the clouds with aerosol paint. It was easy to do. What kind of locomotives do you run? I run some brass, lots of Rapido, and the usual collection of Athearn and others gathered over the years. What kind of industries are there? The layout is virtually all industrial complexes built from photographs or magazine articles of real industries. A wide range of industries are in use, including furniture factories, a large brewery, and other rail-served facilities. There are approximately 30 industries and 15 railway facilities, from freight sheds to engine service facilities etc. How did you build the structures? The structures on the layout are 99% scratchbuilt. A good percentage of rolling stock is either scratchbuilt or from wood craftsman kits. The station is a replica of Stratford, Ontario station, fully scratchbuilt from archival and recent photos. The platform is made from real cement mixed with white wood glue and shuttered just like in real life. It also contains wire rebar inside. When did you start the layout? Did you build it alone? I started it in 2006. The bulk of it is of my work. However, I do have a young friend who helps from time to time. The brewery is a joint effort. Any special or unique features of the layout? The electronics for the layout are all installed on pullout shelving, so all maintenance work is carried out from above. No crawling under the benchwork to do repairs! I use a lot of relays for lighting, frog switching and signalling. All the wiring is numbered and fully recorded and I have well over 2,000 connections so far. The facia panels are all easily removed and are self-supporting. They carry the track plan replica in various colours and use small push to make buttons to operate the switch machines and reverse polarity switching where necessary. All the switches have bi-colour LEDs to identify route selection. A full double bus bar system is used, looping between each pullout shelf giving very small volt drop throughout. How long have you been a model railroader? I had a Lionel train as a child and enjoyed building models right through my life. I started properly in 1983 when I lived in Great Britain. I joined the NMRA British region and became the first Master Model Railroader of that region in July, 1995 (#240). My love of trains and the pleasure of building things. I am a retired chartered marine engineer, and love all things mechanical. Every aspect of the hobby is so rewarding. The variety is endless, together with the tremendous friendships built up over the years in this wonderful hobby. In 2009, shortly after starting this blog, I published an interview with Jason Shron about Rapido Trains. At that point, the company was five years old. Note: The article is longer than normal. (Jason always has lots to say!) So grab a coffee or something stronger, sit back and enjoy. What have you learned about model railway manufacturing since you made your first product? That would fill an entire book! But here are a couple of bits of information that I find particularly useful. First, you need to know when to say "it's good enough." If you've lived with a project from the beginning and you know every rivet on a particular model, it is very tempting to want it to be perfect. But the truth is it's a mass-produced model. At some point you have to accept compromises. For example, there is a thin line on the nose of a locomotive. Colin, our LRC factory boss, pointed it out to me and said "we can do better—we are going to redo this line." Now this project was already several months behind schedule, and honestly that line looked OK. I explained to Colin: "Yes, you can make it better. But then what else will go wrong during the whole process of moving those shells through the paint shop one more time?" I accepted the shells and not a single person has complained about that yellow line. On another project, the project manager at Rapido was relatively new and he would not accept the printing quality from the factory on one model. I looked at it and said "It's not perfect, but it's good enough. Send it out." Again, we did not receive a single complaint. It really was good enough, but the project manager was too close to the project and he couldn't see that. Second, you can't be a one-man band. You have to put together a team and trust them. Having initially built the company on my own, I was very hesitant to give up control. But the company will never grow if the guy in charge doesn't learn to allocate and trust. Now most of the project management is done by Bill, Gareth, Dan Darnell and Josh. I just supervise. And I lead on the occasional project, like the N scale TurboTrain or the British buses. But I trust them to do most of the development work, and I trust Gareth to design our ads. When he started I would go over his designs with a fine-tooth comb until he finally said to me in frustration, "Do you want to do these yourself?" I learned to take a step back and let him do his job. He's better at it than I am. What things you would never do again? I'll never have a business partner, apart from my wife, Sidura. I had a silent partner once and it was very difficult to run the business because the two partners had competing visions for the company. This resulted in a lot of clashes and a lot of stress. 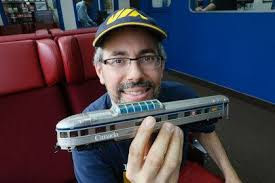 I know that some of our competitors have owners who have lost, or never had, a passion for model trains. And the guys running the companies have great ideas but the person in charge of the money keeps saying "no." I believe strongly that you need to have passion to be in this industry, both in terms of running the company and in terms of paying the bills. If you just see model trains as a means to make a profit, you're in the wrong business. You have to love it and be willing to take risks because of that passion. The RDC was one example. I thought the RDCs on the market didn't do justice to this train, which was such an important part of twentieth century North American railroading. Most people told me I was being ridiculous and there were too many RDC models out there. I ploughed ahead anyway and it became our biggest-selling powered model ever. We've just announced the Tempo, the missing link in my personal passenger fleet. You can't model Toronto from the 1960s to the 1980s without the Tempo, but I always figured it would never sell. It's such a regional train and it only lasted for 20 years. Now that we were doing the RS-18, I thought, "Well I can sneak the Tempo in now and its losses will be hidden by the big profits on the RS-18." Guess what? In the short time since we announced the RS-18, RS-11 and Tempo, the biggest seller is the Tempo. And I mean it's not even close—it’s miles ahead. Eventually it will be taken over by the RS units, but it's really, really selling well. People are ordering the entire fleet. We may actually break even! What things do you wish you could do over? The HO scale Turbo. Short and long of it. The Turbo was our first powered model and I didn't really know what I was doing back then. I'd like to redo the HO Turbo as a model that completely breaks new ground and makes people's jaws drop. It also needs to run like as Swiss watch. Our British APT-E was just as complex and it ran like a dream. So it can be done . . . .
What is the greatest satisfaction you get from owning Rapido Trains? I get great satisfaction from recognizing that there are many other people who want the same models, with the same level of detail, that I want. 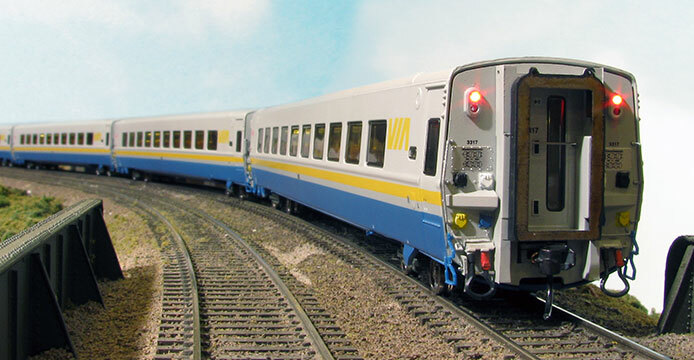 When I see people getting excited about the prospect of owning a model Tempo train, I realize that I'm not completely alone in my obsessions! It's nice to be able to help grow our hobby and bring out unique models, like the Tempo or the New Haven Jet, that nobody thought would ever come out as an affordable plastic model. And I also get great satisfaction when people who worked on the railway come to me and tell me I nailed it. It happened when the Turbo came out. A Pratt & Whitney technician told me he could close his eyes and it was as if he was standing in the Turbo Bay at Central Station starting up the Turbo in the morning. 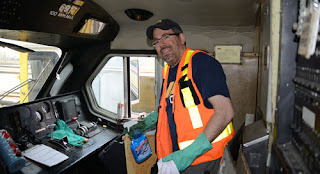 I also like that owning Rapido has given me the opportunity to build relationships with VIA Rail, Canadian Pacific, Exporail, the TTC, and other organizations of which I have always been a fan. The most satisfying thing, though, has been our restoration work. Being able to save RDC #6133 and Edmundston brings me the most satisfaction. When the Turbo was scrapped I was seven years old and it was heartbreaking. Having the resources to save these important parts of our railway history is the biggest gift I have received from Rapido. Models are great fun, but if we allow the real trains to all be scrapped, future generations will have no idea what late twentieth century railroading was all about. The 1950s are well represented in our museums. But the late twentieth century is being scrapped all around us, and we as a community do not have the resources to save these important pieces of our history. We need to work harder to save the second-generation diesels and more modern passenger and freight equipment. I won't let VIA scrap all the LRC cars; I'll be lobbying hard to have some of them donated for preservation. We should even save one three-car Renaissance set, if we can. Cash flow. Cash flow can make or break a business, and in our industry you need enormous amounts of cash. We pay tooling costs up to two years before we deliver a model. Say we have ten different projects in development with an average tooling cost of $75,000. That means that we're paying $750,000 in tooling costs before seeing a single penny in sales from those models. The sales of those ten models may be worth $4 million, but if you run out of cash while those products are in development, your business is finished. It was very, very tight around the end of 2017. We were with the same bank that we were with when the business started. While the business has grown five-fold in the last seven years, the bank still treated us like a small business and we did not have the needed funds to operate. Another bank approached us out of the blue, looked at our financial statements, and immediately offered us a package worth more than double what we had before. That freed up the funds to get the RS-11, RS-18, N scale Dash 8, and Tempo into the tooling workshop. 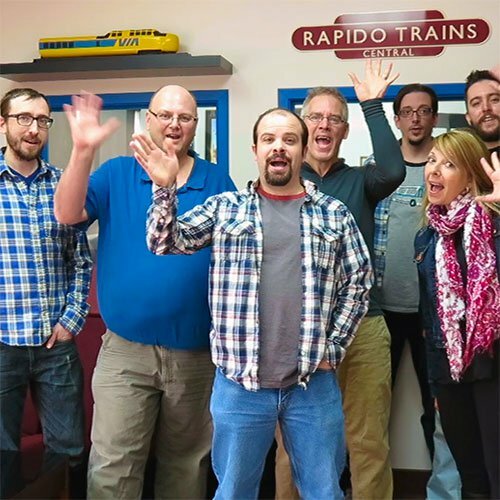 What do you wish model railroaders knew about operating a company like Rapido? 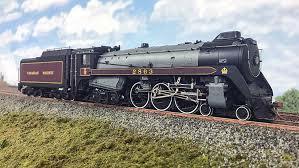 Model railroaders need to know that it is very expensive to make a mass-produced model train. And it's not just a couple of guys working in a basement. When someone asks us for their favourite oddball model or to paint our models in the colour scheme of their favourite short line, it's clear they don't understand the costs involved. The tooling costs for a new locomotive range from $60,000 to $140,000. If we sell 3,000 pieces, that means the tooling component of the cost is $20 to $47. So if we were to make the GMDH-1, for example, and we sold 500 of them, the tooling cost would be around $140 per model. That doesn't include material, assembly, overheads, etc. That's way too high for the project to be profitable. Similarly, setting up a model for paint and lettering takes several days. It's the same amount of time whether you are making one or 1,000. So while there may be four guys who want us to paint the RS-11 in the colours of the Southern Peru Copper Corporation, the costs involved mean that we need to make a minimum of 300. So each of those four guys needs to buy 75 models! Our customers should also recognize that there is a lot they don't see. They may see a decision we make and say: "That's such a dumb decision. They should have done X instead." But the decision may be due to a production or tooling issue and have nothing to do with the prototype. It could have to do with cash flow. If we see that money will be tight a few months down the line, we may need to delay a project with a low profit margin and leapfrog it with a project with a high profit margin. That happens more often than you would think. Even though Rapido is more forthright than other manufacturers, there is still a lot that happens behind the scenes. visiting the M & M Sub. What changes have you seen in the hobby since you started Rapido? Since starting Rapido I've seen the interests shift as new people get into the hobby. Our biggest seller used to be 1950s CN and CP, hands down. 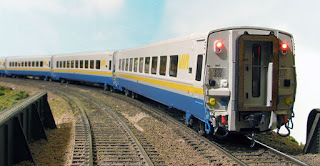 Now when we produce Canadian passenger equipment our biggest seller is VIA. In terms of freight, the 1970s and 1980s paint schemes are now outselling the 1950s, but the 1950s are still a strong second. What has really surprised me is the lack of interest in 1960s Canadian railroading. This was a great time for railroading in Canada, especially if you love passenger trains. Expo brought a huge influx of tourists, investment in CN's fleet, oddball leased equipment, you name it. It seems that very few people are modelling the 1960s and early 1970s. It's either 1950s or 1980s. I've found that very surprising. It also reflects, anecdotally, what I've observed. Our hobby has always been strongest among guys in their 50s and 60s. But I'm seeing a lot of younger modellers coming in, guys in their 20s to 40s, and then there are the long-time modellers in their late 60s to 80s. But I'm not seeing a lot of new people come in who are in their 50s right now. I think this is a reflection of the realities facing people born in the 1960s. Their lives are still too busy. Their kids were supposed to move out by now, but either they haven't or they've moved back in and taken over Dad's planned layout room. Many of my friends are in their early to mid 50s and most of them still have kids at home. Thirty years ago, that would have been unheard of. We’re also seeing consolidation. Rather than having 200 small hobby shops across Canada, soon there will only be about 50 medium-to-large shops. The ones that do the best in the long term will be the ones who have a passion for the hobby and who are innovating, showing their products on YouTube, making it easy for customers to shop online, etc. The small hobby shop owner who has no clue what models have been announced and takes five weeks to order that detail part for you—his days are numbered, if not over already. The winners will be the ones that are on the ball, know what models are being produced, understand good customer service, and can serve both the walk-in and online markets. If the dealer knows the product line and the prototype, he or she will do a much better job selling than the guy who sees all CP or all CN engines as essentially the same. What accounts for the boom in Canadian model railway items? The U.S. recession post-2008 was much, much worse than the slowdown in Canada. Most people in Canada have no idea how bad it was there. Sales dropped off a cliff. Some U.S. manufacturers had Canadian models in the works and saw that their Canadian sales hadn't dropped off in quite the same way. So we had a flurry of Canadian models for a while. That's died down now. The only U.S. manufacturer investing much in the Canadian market is Bowser. Between Bowser and Rapido, most of the requirements of the Canadian motive power market are covered. Even with all of the attention from U.S. manufacturers of late, Rapido has produced more different Canadian prototypes than all of the U.S. manufacturers combined. That's something we're proud of. Even though we've expanded into the UK and we've produced more U.S.-specific prototypes, we will never abandon the Canadian market. I don't have everything I need for my layout yet . . . .
Where do you think technology is going in the hobby? Most model railroaders are not interested in tech for the sake of tech. Smart phone throttles have been around almost as long as smart phones, but most of us don't like using smart phones to run our trains. So it hasn't caught on. I think when the right development comes along that makes people say "Wow—I need that!" then the hobby as a whole will adopt it. I have no clue what the next method of control will be. I've heard lots of people discuss the future of the hobby being battery power and radio control, but it hasn't caught on yet. DCC developed over a generation and is now commonplace, but a lot of people still use DC. The only way all of us—DC and DCC users alike—will switch to a new technology is if it proves to be superior to what we've got. If it is superior, it will win. Simple as that. DCC is great but it is not a panacea, otherwise everyone would have adopted it by now. But tech comes into the hobby in other ways. A number of companies like Signalogic Systems in Edmonton are making realistic signalling possible. 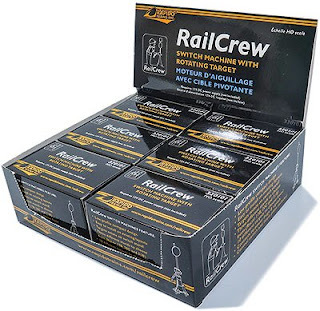 Our RailCrew switch machines are the technological development I've been waiting for my whole life—a switch machine that also rotates the target on the switch stand. I remember daydreaming about that over 20 years ago, then Randy Schnarr comes along and invents it. It's a very big seller for us. We hope to eventually be the #2 switch machine after Tortoise. But where tech is going is anyone's guess. What do you think is the future of the hobby? I think it will continue pretty much in its current form for some time. 3D printing is taking a LONG time to come into its own, but eventually we will be able to do a lot more with 3D printing as hobbyists. I certainly hope I can 3D print some of the more repetitive bits of Union Station and Spadina as opposed to scratchbuilding and casting them. But that will depend on 3D design software becoming very accessible and easy to use, which at this point it isn't. The hobby has a long future ahead of it. I don't know that all of the current manufacturers will still be around 20 years from now. But I certainly don't see the hobby retreating the way that plastic kits have done over the last 20 years. Model railroading is unique in that it is so diverse; you don't just build or collect models but you actually operate them as well. Some people are in it for the scenery, some for the scratchbuilding, some for the technology, some for the collecting, some for the operation. This hobby has so much to offer, and I see it continuing for generations. The best thing to ever happen to model railroading in the last 30 years has been Thomas and Friends. Thomas is HUGE. And when the kids who grew up with Thomas have kids of their own, they will look back fondly on the hundreds of hours of enjoyment they got from their Thomas toys. A train is a train is a train. A boy who builds a Thomas empire at six has what it takes to build a basement empire at 56. Many of us look back fondly on our Tyco or Lionel sets. These kids will look back fondly on their Thomas sets. There hasn't been this much interest in toy trains since the 1950s. What is the future of Rapido? Rapido has grown far beyond being just me. A lot of people think I still do everything. I don't, and I haven't in many years. There are 12 of us at Rapido now, plus the team in China. In the early days, I couldn't be away from the office for more than a few days because some crisis or other would come up that only I could solve. Today, I have a whole team of problem solvers. I trust Bill to manage the factories as well as I can. He could run the company without me if he needed to. I trust Dan Darnell and Gareth to research and develop a model train from the ground up, and Josh is learning that process. I trust Sidura and Janet to make sure we don't run out of money, and Dan Garcia and Jordan run the warehouse and make sure we actually ship products to our customers. Dan also develops most of our DCC sound programming, and Jordan is becoming a YouTube sensation; you'll be seeing a lot more of him in our videos. Three new faces at Rapido are Mike, Mohan and Roslyn who keep on top of things at the office. I'm still needed, but not nearly as much as I used to be. And that is a good thing for the health and longevity of the company. And finally, are you still having fun? I am very lucky to be able to do what I love for a living. I get to travel to train and bus-related sites all over North America and the UK for research and meetings. It's fun to have a business meeting in a first-class compartment going up and down the line on the Severn Valley Railway. And come on—I’m getting my Tempo! RDC photo above by Otto Vondrak.